payment in the context of the indieweb refers to a feature on an indie web site that provides a way for the visitor to that website to pay (currency, gift card credit, etc.) the person represented by that indie web site. For details on making payments to support the IndieWeb, please see The IndieWeb's open collective page at https://opencollective.com/indieweb. anyone who visits your website can easily pay you (for whatever) in the ways you prefer to be paid, similar to how communication links help people communicate with you in the ways you prefer. message a friend a payment link like yoursite/pay/16/ for a specific amount, to split dinner, pay for something they got for you like donuts etc. Fees: free with linked bank account, $0.30 + 2.9% for credit/debit. Requires linking your debit card to your account to receive or send money. Can optionally link a credit card to your account. Personal account: none for debit card payments. 3% for credit card payments. Business account: 2.75% is automatically deducted from any payment accepted with Cash for Business. An amount can be pre-selected by adding it to the URL, e.g. Once you have a payment URL e.g. pay.example.com/username/usd/5, link to it with rel=payment, e.g. Alternatively this might read better as just "pay" (also less typing), e.g. For other providers, keep their icon / link - better to keep the option than make it curiously disappear. Note: this can be handled fully serverside. 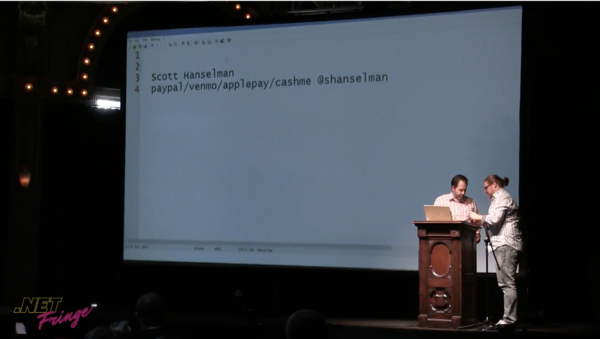 Aaron Parecki uses rel=payment to link to Venmo, Paypal and Square Cash on his home page. Bret Comnes has links to a bitcoin addresses hosted on coinbase a tip jar. I had a dogecoin address that was hosted on dogevault but dogecoin shut down after getting hacked. 2017-12-10 payment page now supports Payment Request API using the Stripe library. 2017-12-10 added /pay/n support for auto-filling $ amounts (coded+deployed at IndieWebCamp Austin 2017 hack day! ), e.g. Jeremy Cherfas has a page for supporters on his podcast site, offering various payment options and ways to pay. If the value to be paid is in GBP and under £100 then a link to pay with Monzo is provided. Other currencies and higher values are handled by Stripe with Payment Request API support. Eddie Hinkle created a sponsor page eddiehinkle.com/sponsor and provides links to it in all podcasts he produces with rel=payment so that Overcast and other podcasts can link to it. The sponsor page will eventually support both one-time payments and monthly pledges. Quite a few podcasters include rel-payment metadata – mostly in their podcast feeds but also on their blog pages. Podcatchers have started using the data to automate donations. Drip is a crowdfunding subsidiary site of Kickstarter. Ko-fi is a service with embeddable widgets that allows patrons or supporters to reward or tip users with money, ostensibly the amount that would purchase a cup of coffee. While not technically a direct payment method, Facebook during the 2017 holiday season encouraged users to add a donation button to their posts to encourage giving to non-profits. In 2018 and expanding in 2019, Facebook also began offering Facebook Fan Subscriptions to creators on Facebook. The feature lets creators offer $4.99 monthly subscriptions to their fans, which gets them access to exclusive content and an opt-in Supporter badge that appears next to the user’s comments on the Page. An alternate, and less direct method of payment, is to utilize an affiliate payment program in which customized URLs to services or products which provide a payment or commission to the referring site. Overcast, a podcast player, shows a payment button on the "now playing" screen if a link with rel=payment appears in the episode's show notes. The podcast host Transistor.fm provides a way to include a link to a payment page in every podcast episode, marked up with rel=payment. <a rel="payment"> in a podcast's show notes would reveal a nice green "$" button on the Now Playing screen in @overcastfm. We just deployed this to @TransistorFM!" Fireside.fm podcast hosting has an advanced option to enter a payment URL, which generates <a rel="payment">. Flattr – publishes rel-payment links on their profile pages as well as on pages for each thing one can donate to. Also heavily uses rel-payment data in their open source browser add-ons. It would also be nice to be able to share a URL with the reason for the payment as well, so when the user taps a payment button, the provider has the reason pre-filled in as well. Take a look at the PayPal.me and Square Cash cash.me UIs, which I *think* let you edit the amount and add a reason. Those may be good enhancements to consider for such pre-filled out payment subpage URLs. Then again if the payment service provides a final opportunity to edit amount/reason, then having that on your own site may see redundant. Note: this could be handled fully serverside. Aaron Parecki has two payment pages, one at /pay/ the other at /tip/. Alice creates a post on her site, representing a payment to Bob, and sends him a homepage webmention. The post includes a link to a 3rdparty site (let's call it Carol's site). Bob replies to Alice's post thanking her for the payment. Carol runs a site that tracks payments, so she looks for specific markup in the original post and subsequent reply. When Alice creates the post, the payment is currently pending. When Bob replies, the transaction is settled. If Carol's site was considered trustworthy by both parties, they could use a separate mechanism to transfer funds to her account. Carol could then clear the above transaction between Alice and Bob by paying Bob the outstanding amount. In general though, transactions only need to be settled to calculate the new balance for Alice and Bob, and the low cost of tracking payments via webmention means no transaction fees are required, except when real funds are withdrawn via Carol's site. This page was last edited on 8 April 2019, at 11:29.